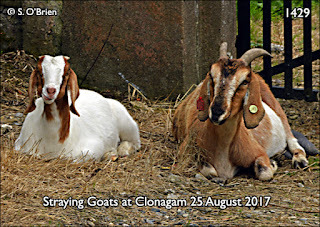 These two goats, pictured outside Clonagam church entrance yesterday, August 25th, have been straying on the road to Clonagam for the past week and may well cause an accident. Forty minutes earlier they were seen on the Portlaw side of Clonagam hill. Apart from the problem/s they might cause, they may well be suffering from lack of water. We're glad to say the goats were back within Clonagam cemetery next day, where, obviously, they have been used to graze, keeping the grass low for visitors, etc.